Posted by Egbert Woelk on January 2, 2014. One of the most unique airports in the country is within thirty minutes of our home airport, Lawrence in Massachusetts. It is Alton Bay on Lake Winnipesaukee. For most of the year Alton Bay (B18) is a seaplane base but in winters when the lake is frozen, Alton Bay turns into a runway for land planes. In years when it is cold enough for long enough Paul LaRochelle, volunteer manager of B18 and his team clear the snow off of the ice and make a runway for regular land airplanes. On the ramp of the ice runway at Alton Bay. 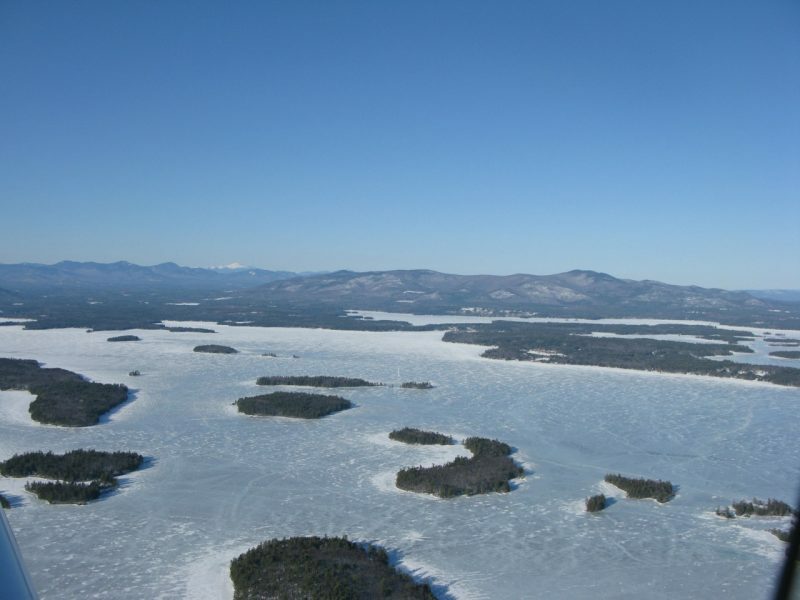 On a crisp blue winter day flying over Lake Winnipesaukee is spectacular, especially in a small airplane at a thousand feet or so. Snow-covered Mt. Washington is near and a great sight. Near Laconia which is a few miles away are many ice fishing shelters and a few pick-up trucks are on the ice. The islands in the lake dot the white sheet of ice. Lake Winnipesaukee and Mount Washington in winter. Back in December 2005, we picked a nice calm winter day to fly out to the ice runway. After enjoying a round of sightseeing of the lake we headed for Alton Bay. It is a great view to see the runway and the taxiway east of it. The winds were light and from the North. We approached form the north and entered the left downwind. On final there is a great view of the Alton Bay village and the bay. Landing feels normal but the brakes have no effect. Final approach therefore should be flown at the slowest possible approach speed and touchdown within the first 200 feet of the runway. Turning final at Alton Bay. With tricycle landing gear planes the 180 degree turn from the end of the runway onto the taxiway is definitely tricky especially when the temperature is near the freezing mark and the ice is very, very slippery. Differential braking does not render much of an effect. The rudder pushes the tail in the right direction but at the same time the propeller pulls forward and the wheels put up no resistance. Although we tried our level best, the turn radius of our Cherokee 180 was way to large and we ended up in front of a snow bank. We had to turn off the engine and manually align the plane with the taxiway. This would have been difficult as a single pilot but with two it was no problem. Once parked on the “ramp” there is usually a number of pilots to talk to. On a nice weekend there is also an interested public out and about who like to look and learn about airplanes and flying. Normally there is a little cafe/restaurant just on the beach to warm up over a cup of hot coffee or tea. Flying into Alton Bay is a great experience and great fun.